Uighur rights groups have felt the brunt of a coordinated pro-China “cyber-abuse” campaign that has taken aim at their social media feeds, with some Facebook posts receiving over 3,000 comments denouncing Xinjiang separatism. The campaign was highlighted by Munich-based rights organisation World Uyghur Congress on Wednesday in a series of tweets: “In a clearly coordinated attack, @UyghurCongress Facebook page has been spammed by hundreds of Chinese users,” one read. Another Uighur rights group, Talk East Turkestan, was also subjected to online harassment, most of which included images purporting to show a peaceful society in China’s troubled far western region of Xinjiang. 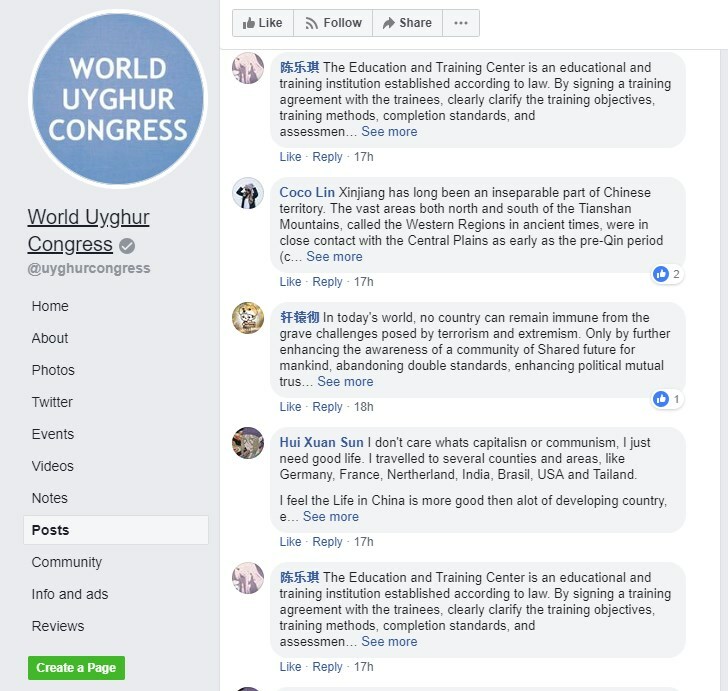 Photo: World Uyghur Congress/Facebook screenshot. Xinjiang, known as East Turkestan by independence advocates, is a northwestern region of China populated by Muslim Uighurs and other ethnic minorities, who are subject to heavy surveillance and tight controls on their movement. 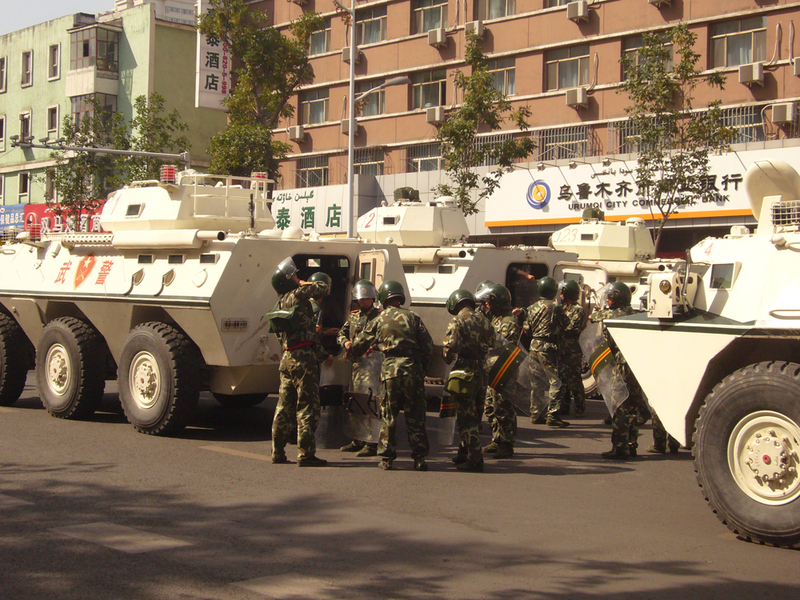 Under the leadership of Chen Quanguo, local authorities have imposed strict “counterterrorism” measures after years of inter-ethnic violence, which is used to justify the detention of upward of a million in extrajudicial “reeducation centres.” Human Rights Watch has said that biometric data is collected from residents, passports are confiscated, religious activity restricted, “abnormally long” beards, public prayers and Muslim veils are banned, whilst vehicle and mobile phone owners are made to install trackers. The online comments are largely copied sections of Chinese Communist Party white papers, according to World Uyghur Congress. Most of them said the measures in Xinjiang were necessary to counter terrorism and that “re-education” centres were lawful. 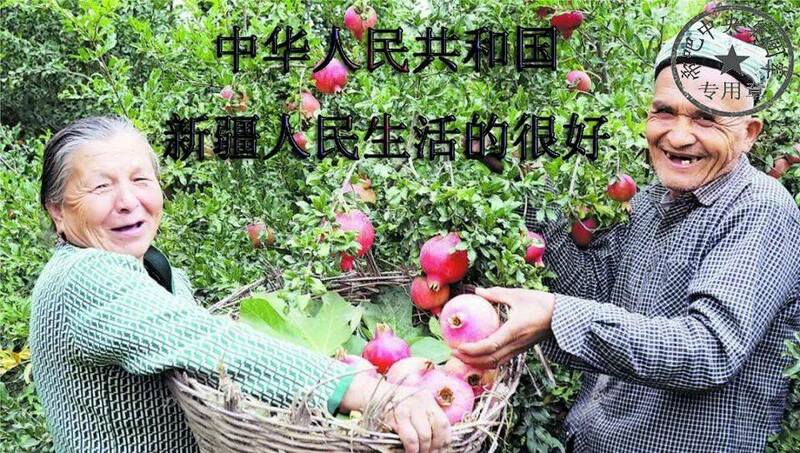 ‘The People’s Republic of China, Xinjiang people live well.’ Photo: Talk East Turkestan comments/Facebook. 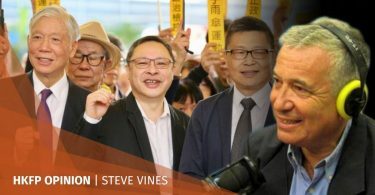 The campaign began on Wednesday and lasted for two hours, Project Manager at World Uyghur Congress Peter Irwin told HKFP. The campaign was part of an organised effort, according to the state-run newspaper the Global Times. The tabloid published an article on Wednesday hailing the commenters as patriotic netizens and identified them as the collective “Diba” – a notorious online group on web platform Baidu Tieba who, in 2016, targeted Taiwanese President Tsai Ing-wen’s online pages with comments saying that the island was an inalienable part of China. Founded in 1993, the Global Times is a tabloid under the Communist Party’s flagship paper the People’s Daily. The tabloid is known for its hard-line editorials. Some analysts say the paper does not necessarily represent Beijing’s official line.